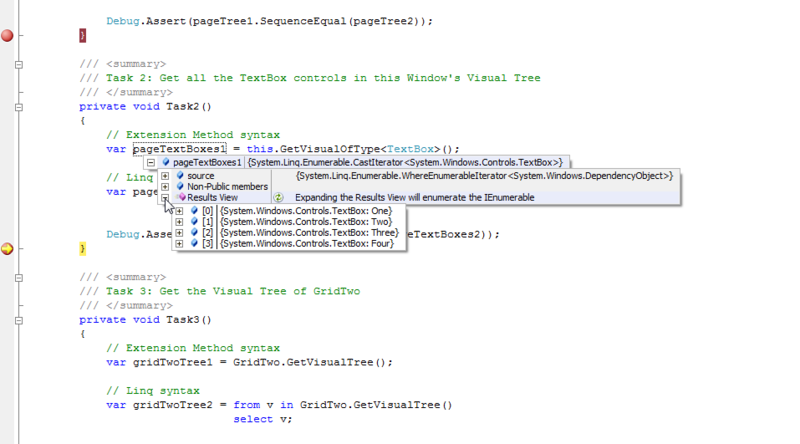 This post presents an early prototype of ‘LINQ to Visual Tree’ for Silverlight 2 and WPF applications. The ultimate goal is to provide applications with the ability to quickly and easily query the Silverlight 2 or WPF Visual Tree via LINQ to Objects. The prototype provides this functionality by enabling enumeration of an application’s in-memory Visual Tree through the IEnumerable<T> interface. This is distinct to implementing a custom query provider: the prototype does not implement IQueryable<T> or execute and translate expression trees. This post demonstrates the basics so far and makes the prototype available for download, it’s aim is to get feedback and ideas on how the simple API can be improved. 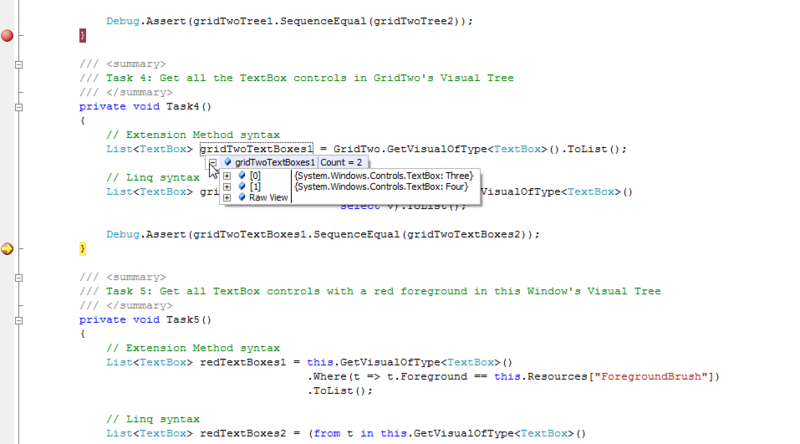 The one fundamental tree of objects that make up a Silverlight 2 or WPF application is the object tree. 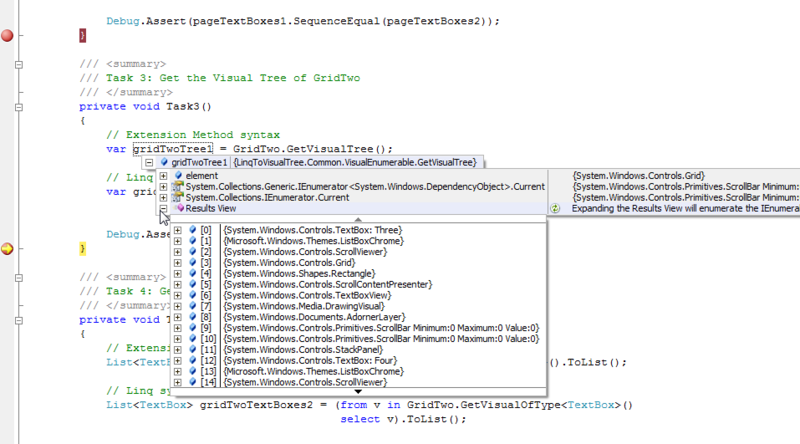 WPF provides two conceptual views of the object tree called the logical tree and the visual tree that if combined would expose the full object tree. 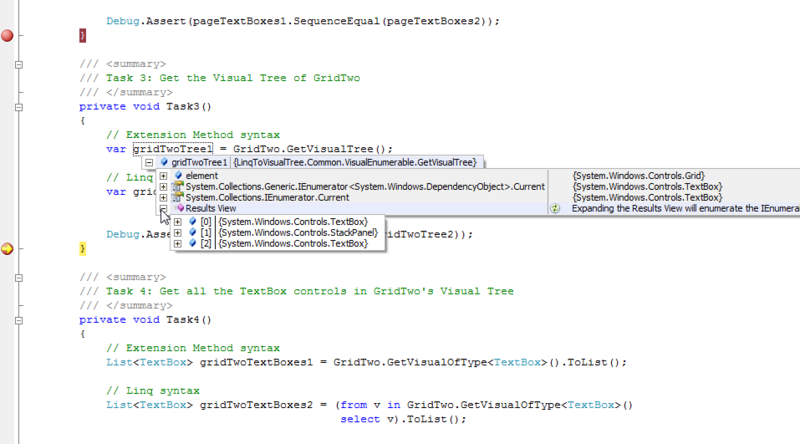 The two conceptual trees are exposed via the LogicalTreeHelper and VisualTreeHelper static classes respectively. The logical tree is a map of elements in the object tree’s element hierarchy (defined in Xaml or in code) that make up an applications user interface, including inferred elements not explicitly typed by the programmer. The visual tree is a map of elements in the object tree’s element hierarchy that derive from Visual or Visual3D, each element is exploded into it’s constituent visual ingredient elements. 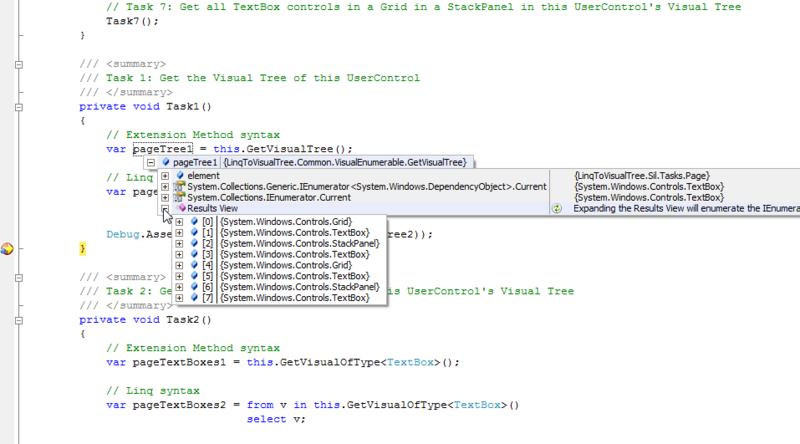 Silverlight does not expose the full object tree, there is more than likely a logical tree behind the scenes but there is currently no LogicalTreeHelper static class to expose it. Silverlight does however expose a visual tree through VisualTreeHelper but the Visual and Visual3D types do not exist in the API. The criteria for an object’s inclusion in the Silverlight visual tree according to MSDN is that the object has a "rendering implication". /// Gets the Visual Tree filtered by Type for a DependencyObject with that DependencyObject as the root. /// Gets the Visual Tree for a DependencyObject with that DependencyObject as the root. 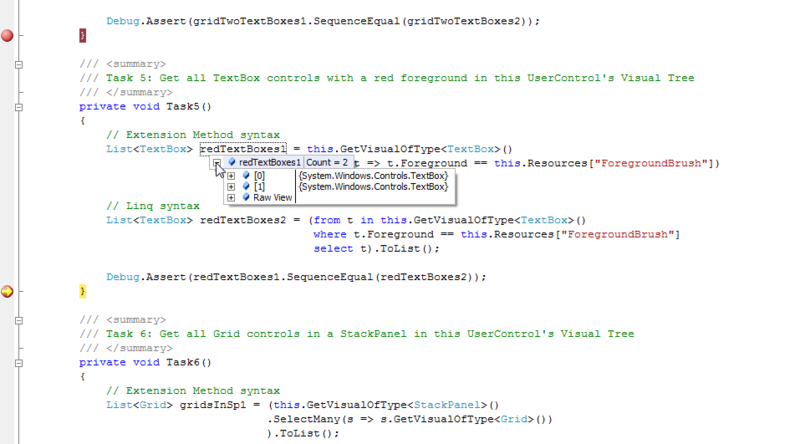 Feel free to download the code and run the tasks to see how the API is used from both Silverlight and WPF. As I say I’m still experimenting with this so I’d love to hear your suggestions and get feedback and ideas on how the simple API can be improved. This entry was posted on March 4, 2009 at 12:49 pm	and is filed under LINQ to Visual Tree, Silverlight, WPF. 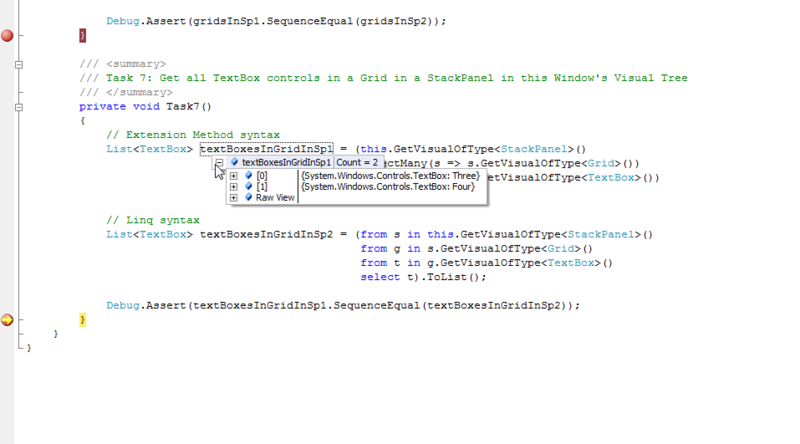 Tagged: LINQ to Visual Tree. You can follow any responses to this entry through the RSS 2.0 feed. Both comments and pings are currently closed. 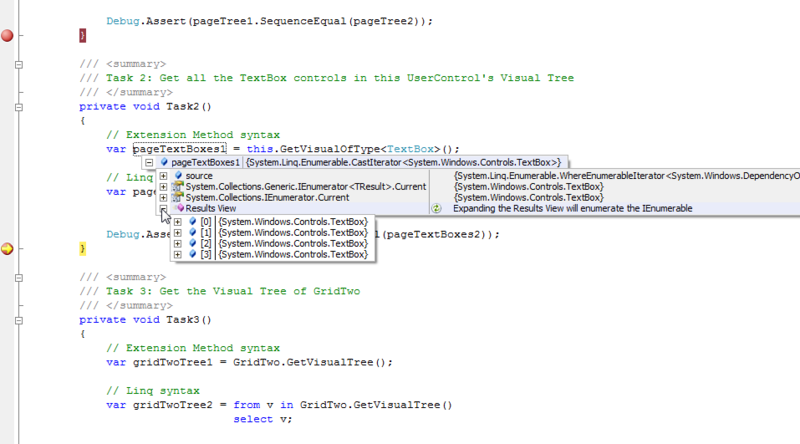 I was just fiddling around with the visual tree and was wondering whether Linq to Visual Tree might be a good option. A quick google search and here I am – great work. My only concern here is that your queries always operate on the flattened list … you cannot perform a query based on the tree like structure. Have you thought about this at all? 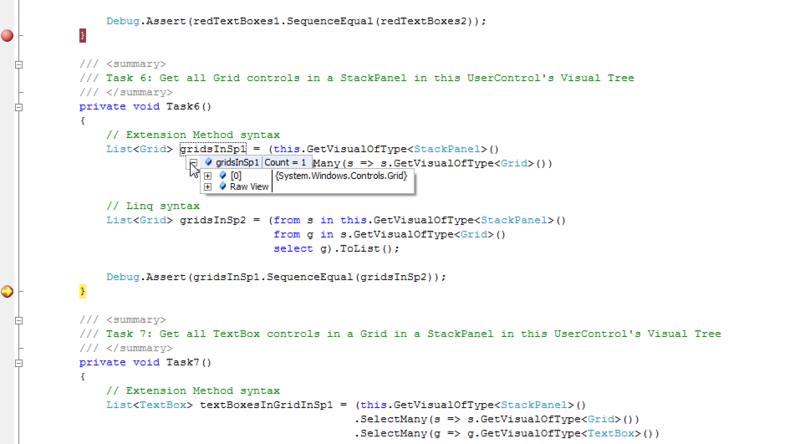 Task 8: Get all TextBox controls that are children of Grids. 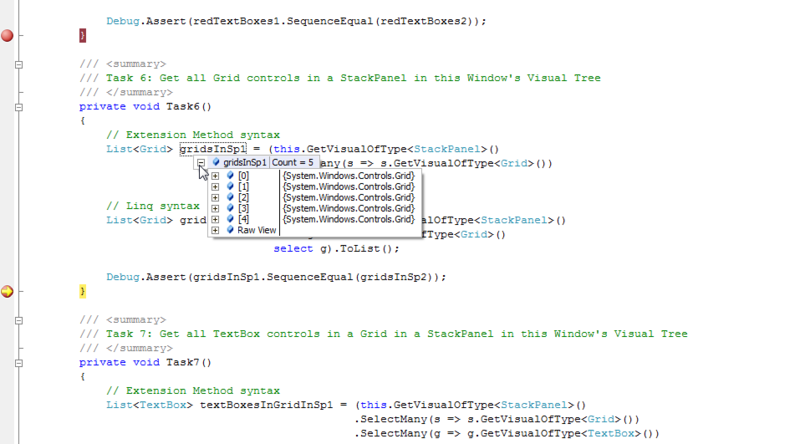 – Include the hierarchy level in the output, instead of a flattened list produce something like a tree view. – More exposure of parent controls. – Finer grained control over queries based on the hierarchy, at present you can get all Textboxes in a Grid control, in future allow where the TextBox’s immediate parent is a Grid. 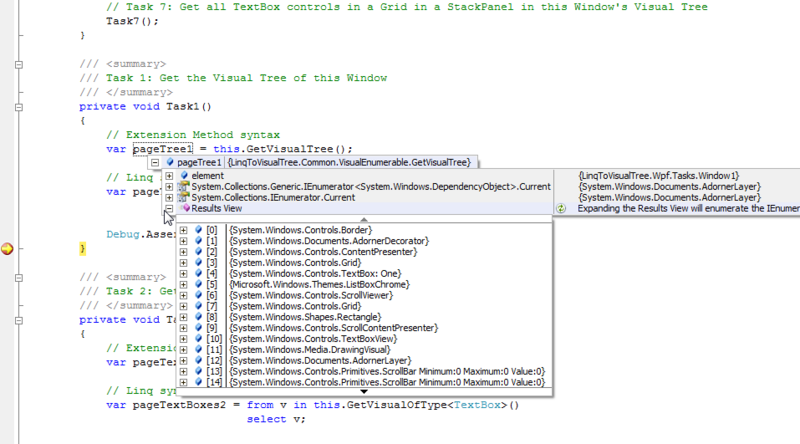 – Possible interaction with a debugger visualizer that would display a diagram of a LINQ to Visual Tree query result. There are probably other things I’ll come across but if anyone has ideas not mentioned above I’d love to hear about them. It’s good to see that you are taking this idea further. 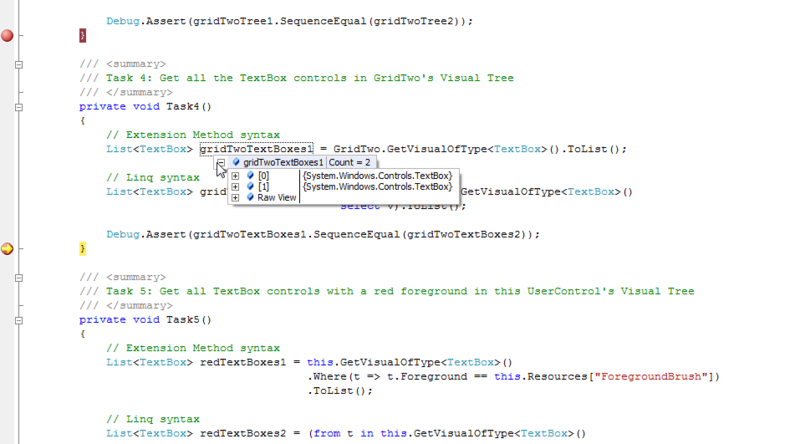 I have also been working on a novel, yet very different mechanism for querying the visual tree. I’ll give you a poke when I have something to show. Hi Peter – I hope you don’t mind, I took your code here and made a few changes to solve some issues I was having. I’ve a blog entry on it. Thanks for your original efforts.